The Wimbledon tennis tournament is in full swing, tennis rackets and balls are on sale everywhere and the weather calls for outdoor activities. What about a game of tennis? 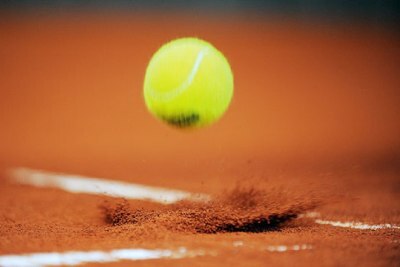 “J’ai réservé un court de tennis cet après-midi à 14h”. If you hear this French sentence, you might have a doubt. It is in fact ambiguous: it could mean I booked a tennis lesson at 2pm or I booked a tennis court at 2pm. The problem only occurs when you hear the word ‘court’. As soon as you can read the sentence, it is clear. Court is definitely the tennis court, whereas for your lesson, you would see cours with an s. As the last letters of those words (t and s) are not pronounced, they sound the same. Court and cours have even more homophones. 2. Short (adjective): elle a les cheveux courts et une jupe courte (she has short hair and a short skirt). 3. He runs (verb, present tense): il court vite (he runs fast). 1. A lesson (masculine noun): j’ai un cours de piano demain (I have a piano lesson tomorrow). 2. A class (masculine noun): Il y a 15 personnes dans mon cours de dessin (there are 15 people in my drawing class). 3. I / you run (verb, present tense): je cours; tu cours. 4. Run! (verb, imperative): Cours! 1. The courtyard, playground (feminine noun): les enfants courent dans la cour de l’école (the children run on the playground). In dramatic art, côté cour (stage left) is used in opposition to côté jardin (stage right). 2. La cour du roi (feminine noun) (the King’s court). The expression faire la cour or courtiser (to court) is linked to this context. 3. La Cour de justice (usually with capital letter) (court of law ) and other legal terms. It seems that the spelling courre only appears in the expression la chasse à courre: fox-hunting. It is a way to hunt animals letting dogs running after them, tracking them. The word courre has the same latin origin, currere, as the verb courir ( to run). Would you rather write cet après-midi or cette après-midi? Both are right. Après-midi is one of those words which is masculine and feminine. Same pronunciation for cet and cette. The masculine singular form of the adjectif démonstratif is normally ce (ce manteau est beau; this a nice coat). It becomes cet in front of après-midi that starts with a vowel. French adjectives change to agree in gender and number with the nouns that they modify. Elle a les cheveux courts (masculine, plural) et une jupe courte (feminine, singular). The final e for the feminine form modifies the pronunciation.